Education for children with visual impairment has always been more expensive than for sighted children. Two primary reasons are scarcity of special educators and affordable tactile learning material. Of the 19 million children with visual impairment, 90% live in low income settings and are trapped in a cycle of poverty due to limited access to education, and consequently, employment opportunities. We attempt to address this problem by creating an independent learning device for blind children. We use an inexpensive webcam camera to make tactile learning material interactive. As a child explores tactile graphics using their fingers, the device provides appropriate audio labels and guidance. Additionally, we have designed games and activities that involve tangible (and reusable) play elements which make learning enjoyable and engaging for young blind children. 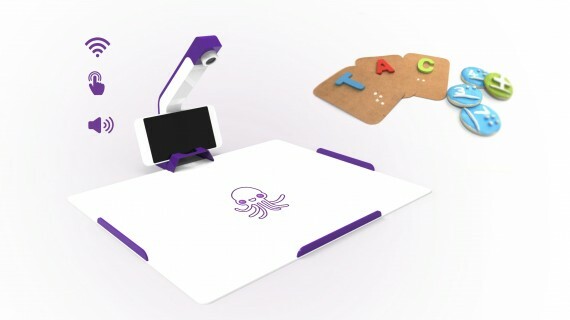 Tactopus tries to level the playing field for blind children by making more content accessible to them and making the learning process enjoyable at the same time. Interaction Awards is an initiative of the Interaction Design Association (IxDA), a global community of over 100,000 individuals worldwide dedicated to the professional practice of Interaction Design. Find out how to join your local group and get involved at www.ixda.org.